MEMPHIS, Tennessee - The St. Louis Cardinals will visit AutoZone Park in Downtown Memphis for an exhibition game against the Memphis Redbirds on Monday, March 25, 2019, Major League Baseball announced Wednesday. 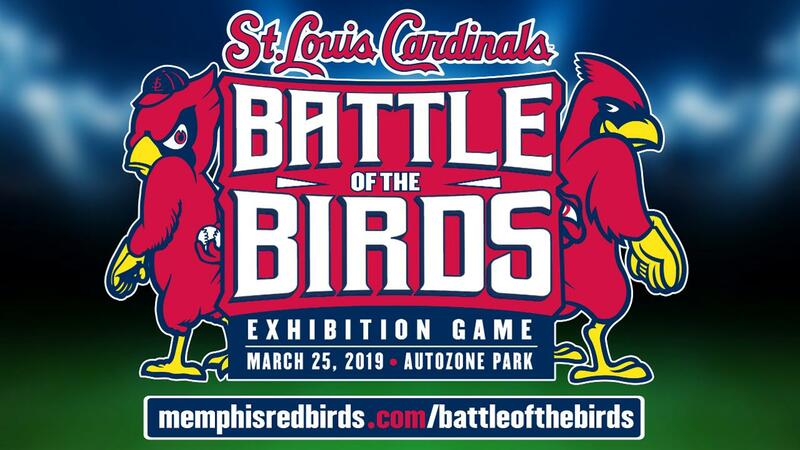 The 2019 "Battle of the Birds" exhibition game will mark the start of the 20th season of baseball at AutoZone Park and be the 10th time the Cardinals have played at the downtown stadium. St. Louis holds a 6-2-1 edge in the series between the Major League club and its top affiliate, with the most recent meeting coming in 2017. "It's always one of the biggest days of the year when the Cardinals come to Memphis," Redbirds President/General Manager Craig Unger said. "We are thrilled to be able to welcome back many of the players and staff who have made the past two Redbirds seasons so memorable and historic, and we could think of no better way to start the celebration of 20 years of AutoZone Park than a visit by the Cardinals. It will also be really special to see former Redbirds manager Mike Shildt managing the Cardinals in this game." "We are always excited to have an opportunity to play in front of our many fans in Memphis," stated Cardinals President of Baseball Operations John Mozeliak. "The Cardinals organization is grateful for the continued support we receive in Memphis, and we are looking forward to our visit next spring." Ticket information will be released at a later date, as will the game time for the exhibition. For updated information, visit www.memphisredbirds.com/battleofthebirds.